Following our conversation with Lidl, the developers have given more details on the treatment considered for some walls and the landscape plans. They have responded also to some concerns regarding the roof impact and parking. “The proposed material for the elevation along Falcon Lane is likely to be louvres. I have attached some successful examples that have been used throughout the UK. Regarding, your suggestion of additional planting, we have proposed a significant amount of planting along Falcon Lane. I have attached the landscaping plan that shows the variety of plants we are proposing. We have also included some more native species. 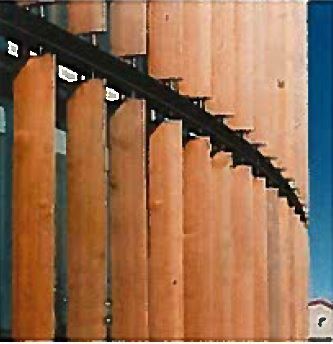 According to the most recent design document, the car park wall along Falcon Lane is screened by the use of vertical panels. Although they are removing 2 trees,they are providing 2 mature trees on each side of the development and four 3 smaller ones. Shrub specimen planting along falcon lane car park wall will be surrounded by a low growing, dense habit hedgerow. On the east side (facing Boots) they are planning an evergreen shrub screening hedgerow followed by a vegetable wall. According to the developers, all this planting is large enough to provide instant impact. Their proposal includes also a wider pavement on Falcon Lane. Following their presentation to the Clapham Junction Partnership on July 18th and comments received they have submitted plans to include a green roof to mitigate the view from adjacent properties. a) Eradicate weeds by hand or chemical means. b) Cut out dead or / and damaged stock or branches, prune as required. c) Ensure all shrubs are firmed in. d) Collect litter, sweep and tidy site. e) Apply suitable pesticides, fungicides and fertilisers as required. All plant material to be watered in dry periods until established during April through to September with a fine rose until the water penetrates the topsoil to at least 5cm depth and achieves field capacity. Frequency of watering regime to de determined by weather conditions, soil conditions and underlying geology, all plant beds to be watered to ensure soil is consistently moist to promote successful establishment. The main objection (planning application 2017/2972) comes from the Battersea Society. For the group, by not offering housing (in a mix-used development), the proposal fails to address the objectives of the local plan and they criticise the low density and recommend a taller building (“Street frontages should respect the prevailing four storey height of the town centre in line with DMPD Policy DMTS3“). They describe the frontage on Falcon road (retail area on second floor only) and the material proposed as “ugly”. Finally they find “the case for an increase of 130% in parking spaces is indefensible, when the retail space is increased by only 40%” and that “the proposal is incompatible with the Council’s strategy to promote cycling, walking and public transport in preference to private car use“. CJAG shares the concern of the Battersea Society about additional risks “to the already-high levels of congestion around Clapham Junction and use of the rat-runs in streets such as Lavender Sweep and Eccles Road“. The levels of air pollution in the area are already in excess of the Government’s Air Quality Objectives and above EU limit values. However we do not support the Battersea Society wish to increase the size of the building with a mix-used development. This increase would be in line with the aim expressed by the Council in the local plan to erect towers in the area (the Travelodge hotel is already 8 storey high, it would be very naive to assume that taller developments would limit at 4 storeys! ), and we know already that this is not supported by the local residents. In addition, while the Council has already reached more than their objective for housing provision in the borough, the comment that “This puts at risk the Council’s strategy (adopted also in 2016) for the provision of new housing in the borough” is at least excessive if not incorrectly stated. The concern on traffic and parking is also mentioned by TfL in a second letter (strangely, on June 16th a first letter sent by the Safeguarding Manager said that he has “no comment on the application“). TfL states that “London Plan policy maximum standards place a limit of 131 spaces” (the proposal is showing 141 car spaces) and therefore considered the increase in parking as unjustified and objects on this basis. Another resident’s comment shows concerns on the illuminated ‘Lidl’ sign on the Falcon Lane side. “We are looking to parking numbers at the moment. However, as you know our car park is always very busy, our surveys have demonstrated the need for additional parking spaces. The London plan is recommending 10% of active bay (charging in 4-8 hours and ready for use) and 10% of passive bay (electrical connection ready but no bay installed initially); for Lidl it would mean 14 active and 14 passive bays. Instead, Lidl is proposing 2 “rapid charger” (full-charge in 30 minutes) and 8 passive. The final external material used for screening the car park along Falcon Lane has not been provided yet, but we would like to recommend using a natural look which will also enhance with age (wood is a good candidate). 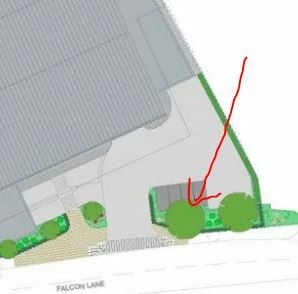 Staff car park (4 spaces) at surface level should be moved inside the car park, as a compromise between the needs for the site and the limitations from the London plan. At least a tree could be planted as represented in some drawings provided by the developer. We acknowledge that the more expensive “rapid-charger” are better suited to food stores. However, with only 2 spots, and according to Lidl, “a typical duration of stay of approximately 60 minutes at a Lidl foodstore“, only 4 cars would be able to charge within 2 hours, while it could be 14 cars able to top-up with the London plan recommendation. Therefore we think that Lidl should provide at least 6 rapid and fast chargers to comply. You can still comment on the planning application on the Council’s website: 2017/2972. A few days ago Lidl made some further small modifications to the proposal, essentially agreeing to your recommendation 2 above (to remove the external staff car park – it’s being replaced with a small green area), and no longer proposing to chop down the two existing street trees on Falcon Lane (which should have some screening effect on the somewhat unattractive facade proposed for that side of the building). The planning officer at Wandsworth is now recommending approval. In 9 years of planning involvement in the borough, that is the FIRST time that I see developers addressing the concerns of local groups and residents and amending their plan accordingly! BRAVO Lidl! In the past we have been either ignored or even worse, getting responses such as Peabody saying in 2012: “At the end of the day, the Council officers are the one to be convinced in order to get a planning application“.